So, at work we have these coffee vending machines. You know the type: stick some money in and get a horrible brown liquid to drink. The ones we have are from a company called Dallmayr. So of course I associate that name with… well, horrible brown liquid. So when, in our search for a place to buy a few local delicacies, we were guided towards the Dallmayr shop, we kind of balked a little. Made some jokes about all the different varieties of sludge we could choose from. Haha! We couldn’t have been more wrong. 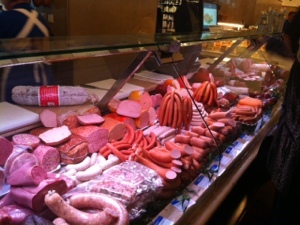 We walked into a Delicatessen wonderland. 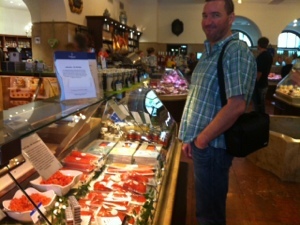 It was bursting full of meats, cheeses, seafood (so fresh that some of it was still alive! 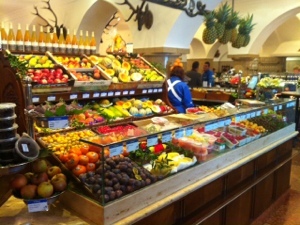 ), breads, fruit and vegetables, salads, dips, fresh pasta, cakes and pastries!! And to top it off there was a little Moët et Chandon café where you could drink the stuff by the glass. How civilised!!! We stocked up on yummy tidbits and set off home – only to promptly get hopelessly lost. Again. We did get home eventually and enjoyed a lovely carpet picnic with a bottle of our favourite Prosecco that we’d happened upon in another amazing outdoor market. We ❤ München!! !